Claudia Riess has recently signed a three-book contract with Level Best Books, which will be re-releasing her book, “Stolen Light,” to be published March 26, 2019. 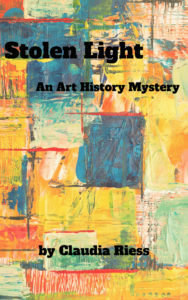 The second book in the art mystery series will be “False Light,” will be published in November, 2019 and the third, “Knight Light,” with a release date in 2020. Erika Shawn, art magazine editor and Harrison Wheatley, professor of art history, attempt to crack the long-un-deciphered code of prankish art forger, Eric Hebborn (1934-1996), which promises to reveal the whereabouts of a number of his brilliant counterfeits. But what starts out as an academic puzzler leads to far darker mysteries in the clandestine world of art crime, culminating in murder. As the couple navigate this sinister world, both their courage under fire and the stability of their relationship are tested.